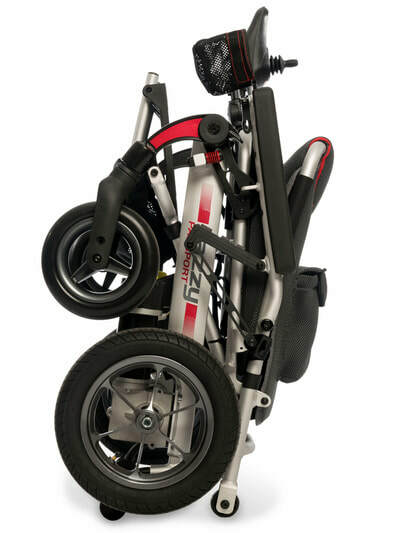 Pride Mobility Jazzy Air $3999.00 IN-STOCK! 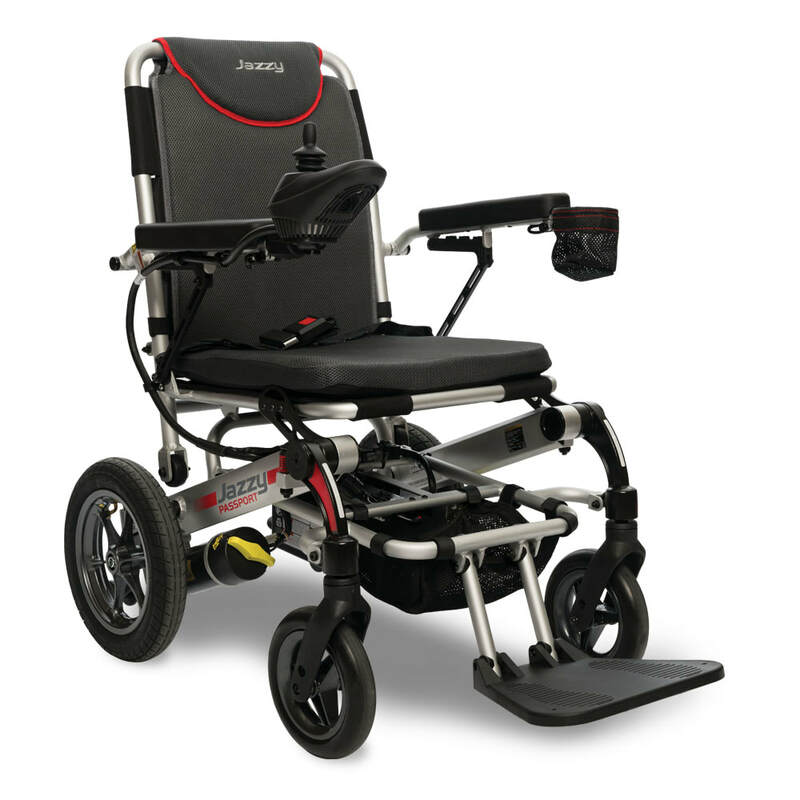 The Jazzy Air power wheelchair by Pride Mobility is truly in a league of its own. Launched in 2016, this new scooter has a revolutionary design that features a power elevating seat that raises an additional 10 inches in just 16 seconds. 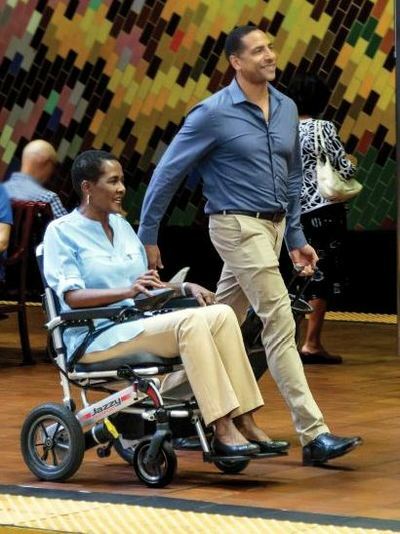 The most unique aspect of the power elevating seat is that it can raise or lower while the unit is in motion, so getting to your desired elevation is convenient and allows you participate in life as it's happening. Imagine that you're headed to a high-top table. With a normal power elevating seat, you have to wait to get to the table before you can raise the seat. With the ability to raise and lower the seat while you're in motion, the Jazzy Air allows you to participate in the present. When the seat is fully elevated, you can enjoy conversations with your friends and loved ones face-to-face. Mid-wheel drive for excellent 22.5" turning radius. Active-Trac Suspension for extra stability and smooth ride. Sapphire Blue with 18"w x18"d seat IN STOCK! The Jazzy Passport is Pride’s new folding power wheelchair. Whether you need a second chair for quick travel to step in for a larger wheelchair, or simply want a convenient easy to transport power wheelchair for day to day usage the Passport will do the job. This is the first folding power chair from Pride Mobility. At only 60 pounds total, this is Pride’s lightest weight power wheelchair. When folded, the Jazzy Passport folds to an easily manageable 31” tall, 16” deep, and 23.5” wide wheelchair. You can tote the chair when folded just as you would a piece of luggage. In addition to being an easy to transport power wheelchair, the Jazzy Passport has a very small turning radius of just 25.25” which is smaller than other folding power wheelchairs. The 24V 18 AH Lithium battery helps keep the chair’s overall weight at a minimum by weighing only 7 pounds. Standard 12” pneumatic rear drive wheels enable you to navigate surfaces that may be a challenge for similar models using only 8” rear wheels. A pocket on the backrest provides extra storage area. A foam seat cushion and backrest come standard for comfort and positioning. The Seat cushion measures 17.5" wide X 16.5" deep. Tha Jazzy Passport has a user weight capacity of 250 lbs. Maximum speed is 3.6 MPH, and has a driving range of up-to 9.6 miles. 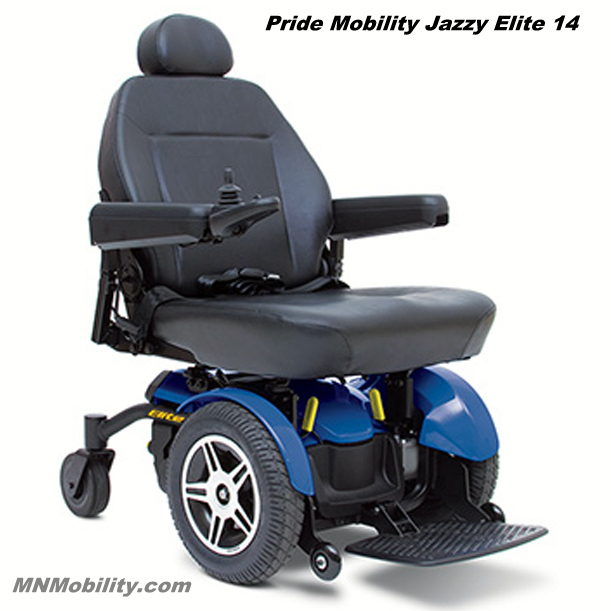 The Pride Mobility Jazzy Elite ES-1 delivers a reliable blend of power, performance, and style. With advanced, in-line motors driving the 9" front drive wheels, you can be assured of excellent stability, maneuverability, and solid performance indoors, and out. This popular Pride power chair also provides you with multiple seating options and accessory choices so that you can personalize your Jazzy Elite ES-1 for your own needs. Easy to use and easy to service makes the Jazzy Elite ES-1 a popular choice. Options of joystick positioning, seating styles and foot riggings assures your comfort during prolonged use. Available in Red or Blue. Passenger weight capacity: 300 lbs. Top Speed: 3.7 mph. Range: Up-to 9 miles. Seat sizes available: 18”-20”W x 18”-20”D. Swing-Away joystick mount: +$168.00. Swing-away, elevating leg rests: +$130.00. 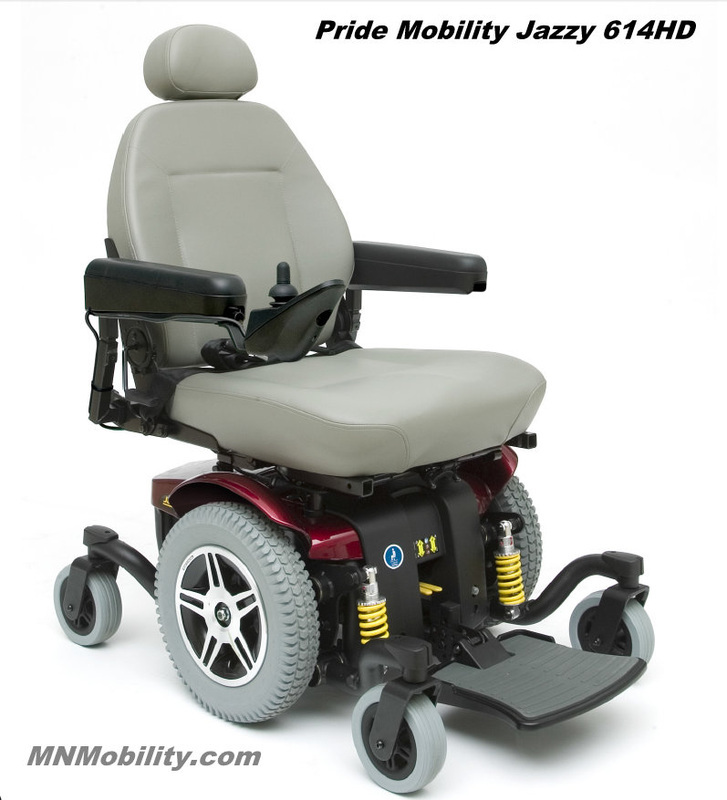 Pride Mobility Jazzy Select 6 $3529.00 . The Pride Mobility Jazzy Select 6 provides exceptional front stability combined with a reliable blend of power, performance, and style. With Active-Trac Suspension and powerful in-line motors driving the 10" front drive wheels, you can be assured of excellent stability, maneuverability, and solid performance indoors, and out. This popular Pride power chair also provides you with multiple seating options and accessory choices so that you can personalize your Jazzy Select Elite for your own needs. The availability of the optional power seat elevator (+ $975.00) makes the Jazzy Select 6 a popular choice for in-home users that want better access to counter-top heights. Options of joystick positioning, seating styles and foot riggings assures your comfort during prolonged use. Available in Red or Blue. Passenger weight capacity: 300 lbs. Top Speed: 4.2 mph. Range: Up-to 11 miles. Seat sizes available: 18”-20”W x 18”-20”D. Swing-Away joystick mount: +$168.00. Swing-away, elevating leg rests: +$130.00. The Pride Mobility Jazzy 600ES features an ALL-NEW compact design that creates a small 22" turning radius making this the ideal chair to navigate indoor spaces. 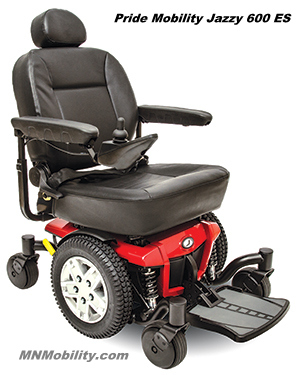 The Jazzy 600ES also has the Active-Trac ATX Independent Suspension system that gives you a smoother ride and allows you to use this chair outdoors as well. The mid-wheel drive function of this chair, with 14" tall drive wheels, allows you to travel over multiple surfaces and terrains. Special, nylon spherical-shaped casters are located on both the front and rear of the chair to help you prevent any wheel hang-up issues and adds stability inherent with having six wheels on the ground at all times. This Pride power chair also provides you with multiple seating options and accessory choices so that you can personalize your 600ES for your own needs. Options of joystick positioning, seating styles and foot riggings assures your comfort during prolonged use. Passenger weight capacity: 300 lbs. Top Speed: 4 mph. Range: Up-to 16 miles. Seat sizes available: 18”-20”W x 18”-20”D. Swing-Away joystick mount: +$210.00. Swing-away, elevating leg rests: +$260.00. Pride Mobility Jazzy Elite 14 & Elite HD. The Pride Mobility Jazzy Elite 14 features an ALL-NEW front-wheel drive design that engages the ground in a way that provides superior traction and easy maneuverability. The 14" tall drive wheels provide almost 3" of ground clearance and allows you to travel over multiple surfaces and terrains. This Pride power chair also provides you with multiple seating options and accessory choices so that you can personalize your Elite 14 for your own needs. Options of joystick positioning, seating styles and foot riggings assures your comfort during prolonged use. Available in Red or Blue. Passenger weight capacity: 300 lbs. Top Speed: 4 mph. Range: Up-to 10 miles. Seat sizes available: 18”-20”W x 18”-20”D. Swing-Away joystick mount: +$210.00. Swing-away, elevating leg rests: +$260.00. 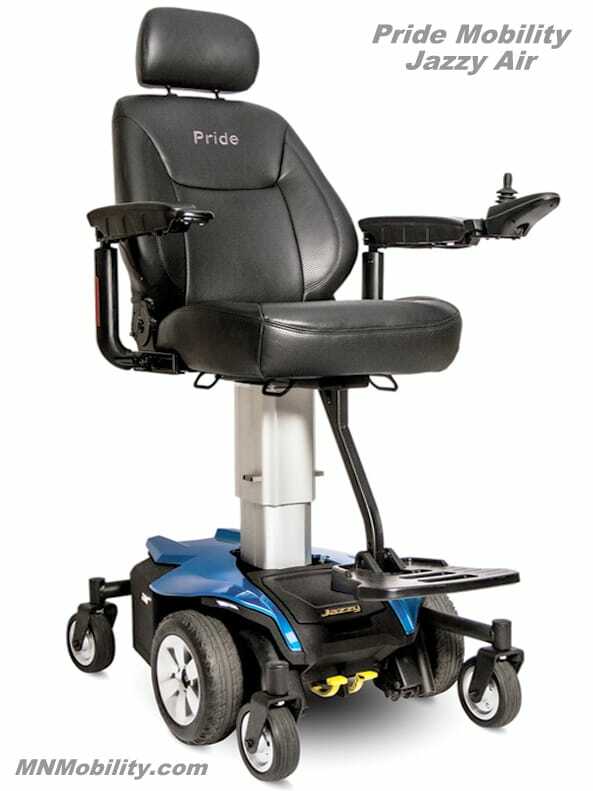 The Pride Mobility Jazzy EliteHD looks identical to the Elite 14, but has the more powerful 60amp controller and increased passenger weight capacity of 450lbs. 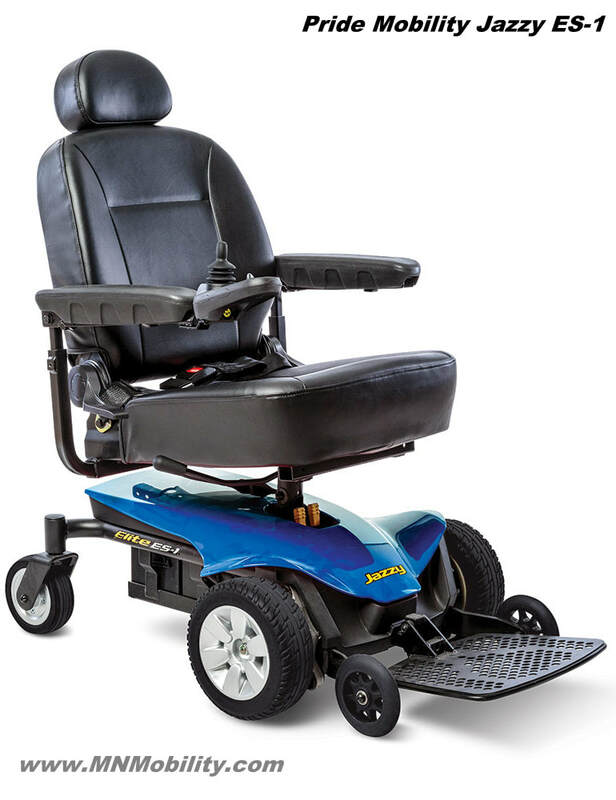 Increased seat size available up-to 24"W x 24"D.
The Pride Mobility Jazzy 614 delivers outstanding performance and superb maneuverability in a powerful, stylish package. Enhanced in-line motors, advanced Active-Trac ATX suspension, and upgraded electronics make the Jazzy 614HD an innovative and exceptional overall value. The 14" tall drive wheels provide almost 3" of ground clearance and the 6" front/rear casters provide ultimate stability while you to travel over multiple surfaces and terrains. This Pride power chair also provides you with multiple seating options and accessory choices so that you can personalize your Jazzy 614HD for your own needs. Options of joystick positioning, seating styles and foot riggings assures your comfort during prolonged use. Available in Red or Blue. Passenger weight capacity: 450lbs. Top Speed: 4 mph. Range: Up-to 11 miles. Seat sizes available: 18”-24”W x 18”-24”D. Swing-Away joystick mount: +$210.00. Swing-away, elevating leg rests: +$260.00.